After 25 years of intensive use, the VUB swimming pool is in need of a thorough makeover. The facades and roof no longer meet current energy saving standards, and from a structural perspective they are outmoded as well. The technical installations have reached the end of their service life and must be replaced. Demolishing the pool itself, however, is not an option. What is necessary instead is a rethinking of its role and function within the context of the VUB mission. It all comes together in a vision centred on sustainability, renovation and enlargement with a teaching pool. Why renovate the swimming pool? 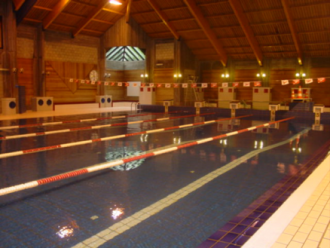 Not only is the swimming pool instrumental in the education of the students of our Physical Education and Physiotherapy Faculty, it is accessible to all VUB students and staff, as well as schools, clubs and individuals in the neighbourhood. As such, it fulfils a social role comparable to that of local sports clubs and facilities. Brussels has a shortage of swimming possibilities. At the same time, our university wants to share its academic know how-about safety and learning to swim. So the decision was made to add a teaching pool to the main swimming pool. This is also a way to expand our already impressive sports facilities. These goals have been welcomed by the European and Flemish authorities, the Brussels Region and the Flemish Regional Commission and deemed worthy of large subsidies (total amount of 3.3 million euro). Yet even these are not sufficient, and so the VUB is both raising outside funds and investing heavily in the project itself. More information on the fundraising campaign can be found on the website of the VUB Foundation. The renovated pool will be housed in a very compact and clear building that is destined to become a striking campus landmark. The existing basin in concrete will be preserved, but a new, sparsely designed volume with a flat roof will replace the closed and dated superstructure. 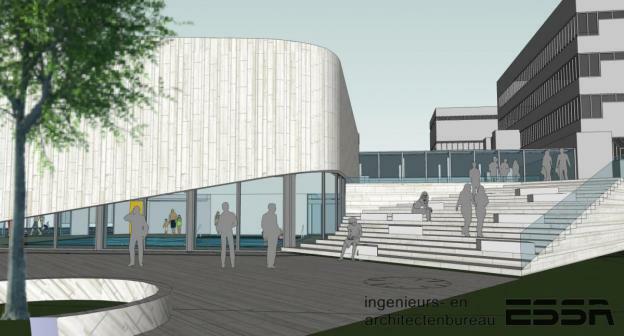 The facade will open into the sports zone and the greenery of the campus and will be flooded with daylight. The new and compact teaching pool will be smartly integrated with the existing pool and be sheltered from the sun and immediate exposure by an imposing yet lightweight awning. 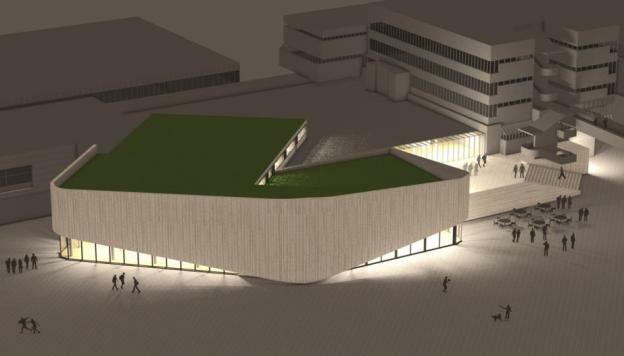 For this ambitious sustainability project, VUB is receiving a major subsidy through the EFRO Programme of Europe and the Brussels Region. 4 large dressing rooms for groups and some thirty individual cabins and lockers will replace the old dressing rooms. The sanitary fittings and showers will be renovated as well. The concrete basin is to be retained, but will be fully retiled. From the platform you will have a view out onto the green campus and the teaching pool. A central lifeguard post for rescue and first aid guarantees safe swimming. 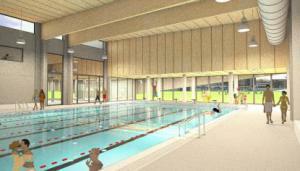 The new teaching pool is 13 meters long and 7 meters wide and will feature a broad stairway and a moveable base. The latter makes it safer to teach small children to swim and results in a safer pool for disabled people. 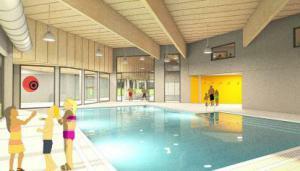 It will also be ideal for leisure activities such as aquarobics sessions. The pool will be provided with a projection screen and recording possibilities for educational purposes. 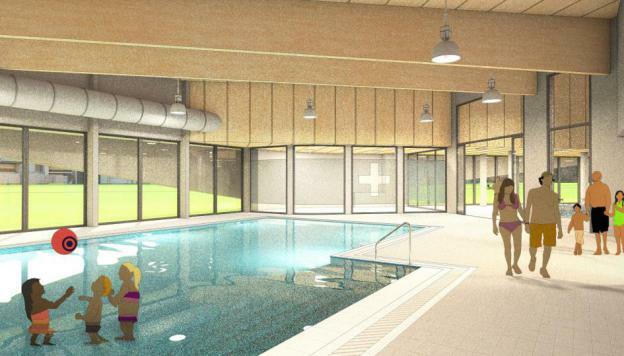 The pool has been designed to facilitate access and make swimming a relaxing experience for special kinds of customers, such as disabled persons or people of different ethnic backgrounds. The teaching pool and the large pool hall can be used together or separately. You can enjoy lunch in the renovated snack bar with a view of the teaching pool and the new terrace complete with wide stairs, offering access to the esplanade and the inner green park site. While the construction works for the swimming pool are yet to start (July 2016), Project XY will already be in full swing. Entry 8 will then be closed as well for all traffic in order to guarantee public safety. We will keep you informed as to all possible hindrances and alternative campus routes and parking possibilities. Apart from the swimming pool complex, building L (sports rooms, basic fitness, offices, classrooms and faculty labs) will remain accessible to the public throughout the works. The same goes for the running track and the tennis court. Entrance 6 at Brussels Humanities, Sciences & Engineering Campus is no longer available from August 2015.
is a restricted area! No unauthorized persons! Questions about the building and renovation projects at the VUB campuses? Contact us at infradesk@vub.ac.be. Thanks to your gift VUB can invest in excellence!